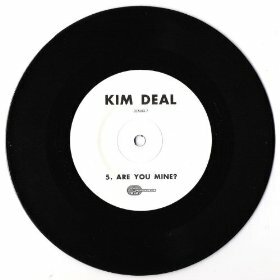 Kim Deal has returned with the third single in her solo series. "Are You Mine" b/w "Wish I Was" is now available as a limited edition single - 1000 copies pressed on black 7" vinyl with white label can be purchased here, and a digital version is available to download on iTunes and Amazon. Like Deal's two other singles, a non-limited edition version of the 7" single with artwork will be released in the future (date TBA). Deal's previously released singles, "Walking With A Killer" b/w "Dirty Hessians," and "Hot Shot" b/w "Likkle Me" are available to purchase with artwork from her website. Deal also filmed a video for the her new single. Check out the official video for "Wish I Was" below or on vimeo. Kim Deal - Are You Mine? [Official Video] from Kim Deal Music [Official] on Vimeo.